Managing employees in a way that keeps them emotionally invested in the business can be a challenge, but it is not an impossible feat. Employee management can be defined as the systematic identification, attraction, retention and development of human capital required to fulfill business requirements. Managing employees and their expectations is important for all organisations and will be of even more significance to companies in the Kingdom of Saudi Arabia (KSA) who are preparing themselves for the inclusion of women in the workplace. In this article, which is part two of the series, we will continue to review how organisations will need to prepare themselves, particularly in the way they manage their employees for the increasing gender diversity that will start to arrive in their workplace. While recruitment may seem like a fundamental and sometimes straightforward HR activity, if not carried out correctly, it can result in difficulties in attracting and retaining talent. At a time when gender diversity is an ever-increasing priority for organisations, it will be even more crucial to develop and implement a robust recruitment process that will help to attract and retain talented women. 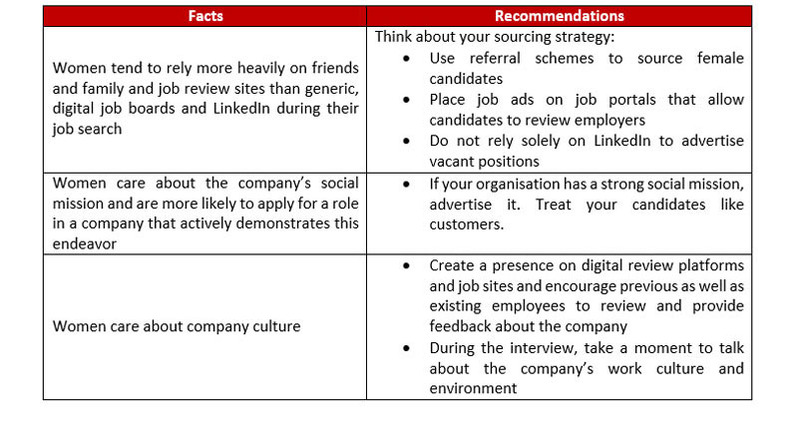 So, how can companies prepare for the recruitment of women? Advertising and promoting gender diversity policies and practices may help companies to attract suitable female candidates, however, living the policies in day to day operations will help increase retention of female talent. Unsurprisingly, financial compensation remains the most important factor for female employees when deciding to stay in their current role or with their current employer. Despite the importance and media attention on equal pay in the recent past, the World Economic Forum (WEF) reported in 2017, that for the first time since 2006, the global gender income gap is widening. They estimate that it will take 217 years to close this gap. While this news is disappointing, some companies like Adobe, SalesForce, WholeFoods, Microsoft, Intel and Accenture have started taking measures to reduce and eliminate the gender income gap in their organisations. Furthermore, Iceland has become the first country in the world to legally incorporate gender equal pay practices. Fortunately, companies in KSA can ensure from the very beginning that they compensate employees, regardless of gender, equitably and according to the true value of the job that they will perform. To ascertain the ‘value’ of each job role, it is important to conduct a job evaluation exercise and benchmark C&B accordingly. The implementation of a robust and fair compensation and benefits framework can go a long way in creating and administering internal pay-equity in a company. Are we prepared to offer the same compensation to a male and female employee performing the same job? Will we pay the same allowances to both men and women? Are we prepared to provide both men and women with the same benefits? With comprehensive C&B frameworks in place, companies can strive for transparency in their compensation practices. Besides enhancing the company’s talent pool, recruiting women may also increase the company’s financial performance. Research shows that Fortune 500 companies with the highest representation of women on boards financially outperform companies with the lowest representation of women on boards. 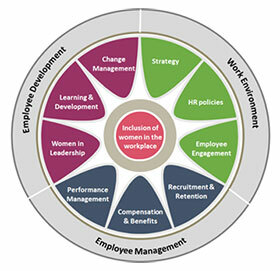 This brings us to the topic of performance management for women. With women entering the workplace, companies will need to prepare themselves for the manner in which they measure and evaluate performance. Managers will need to interact with new female team members, discuss their objectives and KPI’s and provide feedback on their performance. This may not be an easy transition; therefore, companies will need to ensure that the right change management and facilitation initiatives are in place in preparation for this challenge.